After a sequence of embarrassing and painful experiences, a lucky bone gets thrown towards the opposition of good. The true devil inside has awakened. This is not good Marine The Raccoon is looking at Cream The Rabbit's Journal that's a very bad idea. Looks like I spoke too soon about Marine's undies being childish. Also, I get the feeling Cream is going to be in a lot of troublesome and maybe embarrassing situations, if you get the idea. If there's nothing on the front of the undies their might be something on the back. That, or she's accidentally wearing one of Cream's undies. it looks like the cream secret will be discovered, how will it end? I'm looking forward to the next comic. I'm very excited to see Cream humiliated, I hope she is as humiliated as possible (Even naked!) to the view of the most quantity of boys as possible (And that between those boys are Tails and Charmy. 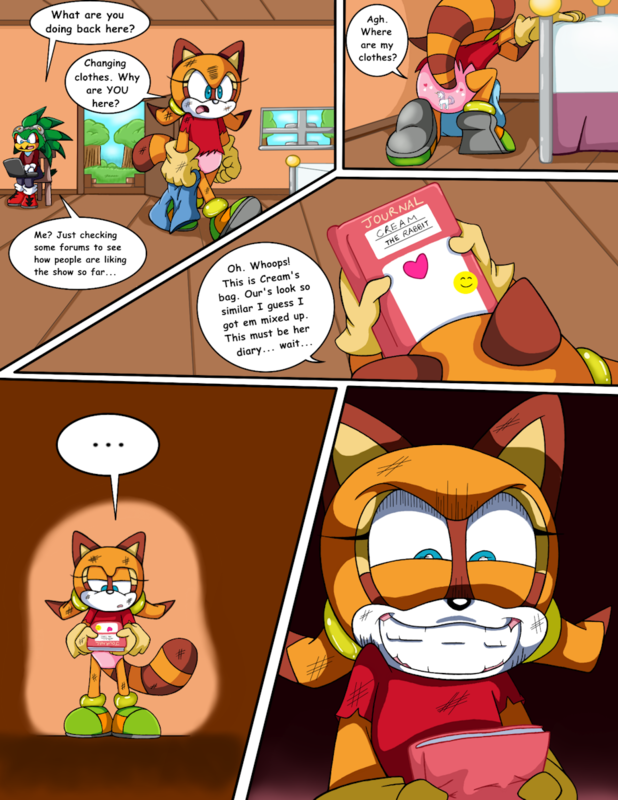 ), Although knowing all your comics I suspect that to Marine can happen the same thing to Charmy when he tries to humiliate the twins. My guess is that everyone will have its turn being humiliated. cats don't dance vibes with that last panel.